What kinda Ol’ West tale is this, pardner? 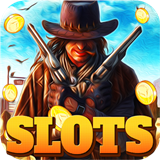 Well, while the excitement of mavericks shooting out their differences is certainly in play here, the Enforcer slots game remains well aware of the greater social situation. Amidst the pistols and sheriff badges are the brands which were the literal trademark of the cowpoke, and the great trains that brought speculators to further West along with those who’d scam them in a thousand ways. The scatter is our hero lawman and, even if the player is zoning on autoplay mode, this scatter can't fail to grab the attention: He shoots his pistols every time he appears. The brand symbol is the wild which auditorily delivers a satisfying sizzle when making up wins. Does The Enforcer Slot have free spins? Even better, the wild brand becomes a sticky wild for the entirety of free spins. How much will I have to ante in The Enforcer slots game? 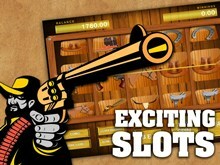 If you’d like to play for real money, Demo Slot Machines can help you out. Simply click anywhere on or near the Enforcer slot game posted on this page or any pages and a popup window will give you the choice to play free or for real money. Choosing the real money option will have you redirected to a partnering casino website guaranteed to provide quick action-packed gaming and fair play.